Why is the robot so bad?! Lost! Toy Story 3! Excess amount of gummy worms! No, the review isn’t about any of these things I’ve experienced or watched lately. Well kinda. You see, at the end of the credits to Lost (which I am now addicted to thanks to a certain Dan that shall go nameless) there’s a bit of rustling and then BAM! Your ears are hit by the sound of a few voices of strangely happy children all saying “Bad Robot!” which I have also grown accustomed to saying with them. Why is bloody robot so bad?! Was he originally red? What does that spring-type thing on his head do? I have absolutely no idea why it’s so addictive. In spite of the fact that I’m spending 40+ minutes of my life on an episode of Lost and I start to think that maybe the robot is a guaranteed payoff has got to be a bad sign. Love the show, don’t get me wrong. But sometimes the show can be frustrating or sad. Then whose there to cheer you the hell on up?! Freaking bad robot to the rescue! That thing has got to have done something good for so many kids to be happy sounding over his (or her) arrival! One of these days, I’m gonna have a bad robot. It’s gonna serve me fine juices and tasty dishes of meat. Then adventures will be had and I will obtain the world. 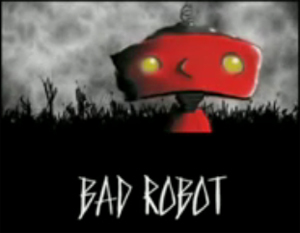 On the reals though, Bad Robot Productions have been putting out stuff since 2001’s Alias and from the other, less catchy versions of their logo, it seems that their Lost edition one hit memorable gold. I know I won’t be forgetting it! Don’t usually take notice of production companies unless they’re ultra big name and I will have to have them ingrained in my mind, but just because this one is so freaking delightful, I had to notice it! Also, totally never watched Alias. It’s short and to the point of showing their name. Just as long as the freaking title is displayed at the beginning of the show. But I reeeally want it to be a bit longer. Like, show me some shenanigans! I’d watch a mini-show about that tiny robot messing stuff up. No freaking problem. That’s why I give this a 7.5 out of 10 explosions! This entry was posted on June 28, 2010, 9:33 pm and is filed under Logos. You can follow any responses to this entry through RSS 2.0. You can leave a response, or trackback from your own site. BAD ROBOTS! He’s so cute and bad at the same time.